Recently, we witnessed one of the worst national disasters to hit the Gulf Coast of Texas. Because I live in Texas, and because our family and staff are so close to so many of the victims, it has become very personal to us. 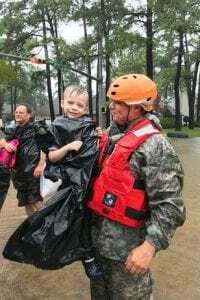 Now that the torrential rains have stopped, the rescues are slowing down, lives aren’t being lost, and people are finding homes and trying to rebuild, I wanted to share some thoughts. Indulge me for a minute, and let me share some things that I have learned over the years. First, this is horrible. Today I was on the phone with a friend who simply said, “We have lost everything.” I sat quietly as they shared what that meant to them. Their pain is real and that is the first part of what has happened to them. The second part is the most important part. Yes, they have lost everything…that can be lost. But the things that were not lost are the things we have to hold close. They had not lost any family. They had not lost each other; they had not lost their souls, their hearts, their will, their passion, their love for others, their talents, their abilities, their future, their dreams, their friendships, their… Do you get the point? The things they owned were not the things that THEY ARE. It is not their possessions that defined them, nor was it those things that are ultimately the most important. We have been very close to the rescue efforts and few people ran to grab their best suit or their nicest kitchenware. They took their pictures, some clothes, anything that had memories or special meaning to them. They took with them the things that best represent their values and who they are. And that brings me to you. You are a teacher. You love kids, and you have the abilities and talent to help them re-frame their lives today in the very face of great loss. They will do as well as you do! If you celebrate the fact that you are still here, you are still a teacher, and you are still filled with love for them… If they know you still desire to make a difference and you still have the heart to overcome whatever you are dealing with, then they will draw inspiration from you, and they will develop the grit they need to face life when it is most difficult. We all have hard times, and this may be the most difficult material loss you will ever know. Let them know that life is more; it is much more. Let your life be the example they need and that will give them the strength to rebuild. Life is good even in great loss; especially if you walk through it with good people beside you. You are those good people…thanks. 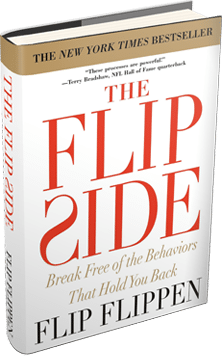 Whether working with Olympic athletes, professional money managers, or military leaders, Flip Flippen’s mission is the same: “To build relationships and processes that bring out the best in people.” He has applied this goal with hundreds of thousands of individuals, providing executive development and organizational consulting in four sectors: education, corporate, sports, and government. With an emphasis on changing behaviors and attitudes that stand in the way of success, he has helped organizations – from small rural school districts to Fortune 500 companies – achieve dramatic improvement in performance, leadership, trust, and productivity. Flip is the founder and president of the Flippen Group, started in 1990, voted the number two company to work for in Texas by Texas Monthly magazine. Today, the Flippen Group is one of the largest educator training companies and one of the fastest-growing leadership development organizations in North America. Their breakthrough educational processes and curricula are in use at thousands of school districts and campuses nationwide.